1. 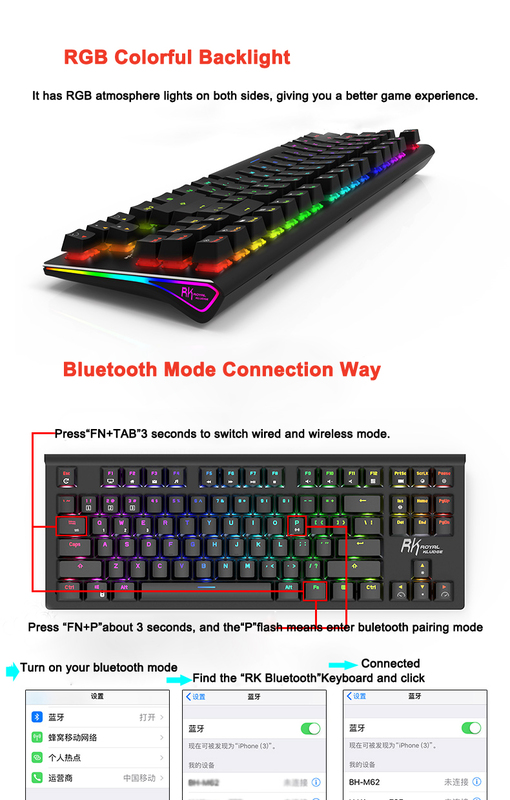 RK G87 is a 87-key compact Bluetooth 3.0/USB wired RGB backlight mechanical keyboard. Randomly adjust select the backlit when used, and you also can DIY three backlit modes. 3. Multi-device and dual connectivity: RK G87 is compatible with most of the bluetooth-enabled devices. It can connected with up to three devices and can easily switched among them. Besides, RK87 supports both bluetooth and USB wired connectivity, which fits you all kinds of using purpose. 4. Built-in rechargeable battery, sustainable use of electricity for 100 hours. With a Type-C data line,used for wire connection and charging. Support WIN keys locked or full keys locked and no conflict when all switches are pressed at the same time. 5. Placed the direction key in a separate position. You can not click by accident when gaming and working. It has RGB atmosphere lights on both sides, bringing you warm work and play environment.